We've all been there at one time or another (good or bad) where we've questioned: "Why Me"? 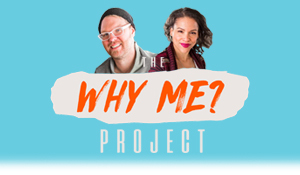 Each week, Johnny and Hollie will interview athletes, authors, musicians, and others you'd least expect to hear about their own "Why Me" moments. Hosts of ‘The Morning Spin’ on Edmonton’s Shine-FM discuss “life unscripted” with inspiring guests who will reveal how they got back up after reaching a painful low. Hollie and Johnny will ask how deep those valleys were, and how they climbed out, shining a light on the world through their testimony.